Arm and lamp head types are listed with descriptions below table to help select the best product for the desired application. Single Swing Arm: Horizontal adjustment at base of the arm, and a knuckled joint where struts connect to allow for both horizontal and vertical adjustment. Flexible Gooseneck: Stainless steel neck is flexible so it can be bent and rotated to any position required, but rigid enough not to sag down under the lamp weight. Double Strut Swing Arm: Ideal for high traffic, high use, situations the heavy-duty arm with a double strut attached to the wall mount that adjusts horizontally, connected to a single strut via twin axis hinge that adjusts both horizontally and vertically. Double Strut: Heavy-duty arm has double struts attached to the base that adjust horizontally, connected to a single strut that also adjusts horizontally. Ideal for high-use, high traffic applications. Double Strut Flex Arm: Flex-Arms provide the strength of standard double strut arm with the flexibility of an impact absorber to help protect against impact. Aluminum Housing with LED Module: LED light module housed in heavy-duty cast aluminum with a polycarbonate, shatterproof lens. 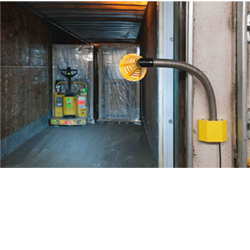 IP66 and NEMA 4 rated for wet locations. Metal Housing with LED Module: Powder coated metal lamp head with built-in LED light module focused cool white light while only using 14 watts of energy. UL and cUL listed. Polycarbonate Housing with LED Module: Polycarbonate light head with LED light module stays cool to the touch, is flame resistant and only uses 14 watts of energy. UL and cUL listed. Polycarbonate Housing with PAR38 LED Bulb: Polycarbonate light head stays cool to the touch and is flame resistant. Comes with PAR 38 LED light bulb, but can also be used with halogen or incandescent bulbs up to 150 watts.